For those just joining us from twenty years ago, Top Gear host Jeremy Clarkson hates a lot of things. There is perhaps nothing he hates more, though, than CNN commentator and one-time British tabloid editor Piers Morgan, who he once punched in the face. Which is part of the reason why their fight over Twitter today was so hilarious. Clarkson's referring to Morgan's tenure at the Daily Mirror, which regularly hacked into people's phones in a desperate attempt to get scoops when under Morgan's command. Morgan always claimed he had no knowledge of the tactic, though the official investigation into the hacking found Morgan's comments "utterly unpersuasive." Clarkson's second bit about the army probably refers to a second incident that occurred that resulted in Morgan eventually being fired from the Mirror, when in 2004 it published fake photographs of British Army soldiers abusing Iraqi detainees. I've known many a muscle-depleted chihuahua that have actually been quite vicious, but I'm not sure Clarkson has the energy for that. Psst, hey Piers! Piers! I'm pretty sure we have. Top Gear been massively popular in the US, spawning its own American-flavored spinoff, and when 60 Minutes ran a special on the show in 2010 it was their highest single rated episode of the entire year. It was watched by 16,000,000 viewers, which is probably a bit more than the average night of Piers Morgan's show on CNN. This whole thing went on for a bit before Morgan called Clarkson a "racist pot-bellied pig," and I wonder what Morgan has against the beautiful breed of the pot-bellied pig, and then Morgan likened him to a gorilla, because why not. 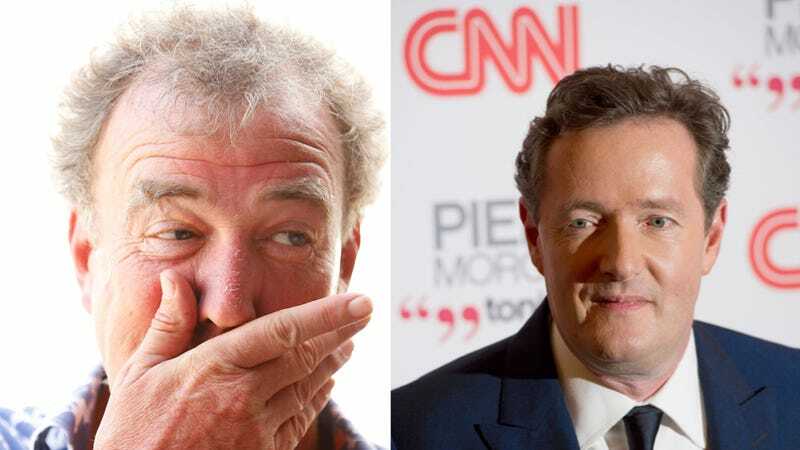 Piers Morgan and Jeremy Clarkson need their own show, right now. If only to watch Clarkson destroy Morgan, and then watch Morgan somehow gloat that he won. I love the United Kingdom.